Beat the eggs in a bowl and add the milk. Just before cooking the egg mixture, add seasoning as to your taste. In a pan, melt the butter and add the beaten egg mix. Cook over a moderate heat, continuously stirring with a wooden spoon or spatula to ensure it doesn’t stick to the sides. Slice the bap open, not quite cutting through and lightly butter on both sides. 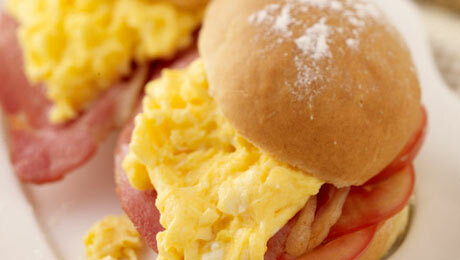 Add the sliced tomato, 2 cooked rashers and top with some scrambled egg - serve immediately.